DigiActive’s slogan is “a world of digital activists” and our goal is a world of citizens politically empowered by digital technology. I often wonder what that world would look like. I envision independent communication, mobilization, and information dissemination, citizens creating new and powerful organizations independent of – and sometimes threatening to – existing institutions. In the United States, in the 23rd district of New York state, we are seeing this future right now. 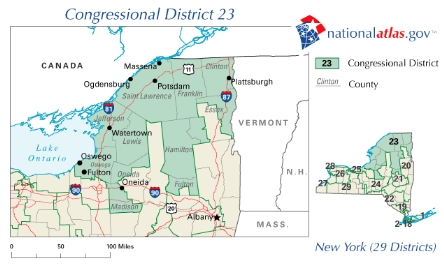 In NY-23, a rural congressional district in the north of the state, conservative grassroots activists are organizing a nationwide campaign to get a Conservative party candidate into office, this in a district that has sent a Republican to Congress consistently since the 19th century. Conservative activists across the country, ignoring the central organization of the Republican party, began sending massive amounts of online donations to the Conservative party candidate, Dough Hofffman, and attacking the Republican candidate, Dede Scozzafava. In part because of the gap in fundraising, Scozzafava suspended her campaign on Saturday and threw her support to the Democratic candidate, further enraging grassroots activists. When I attended the Personal Democracy Forum in New York last June Mark Pesce, a futurist and pioneer in virtual reality, spoke about the tension between vertical and horizontal power structures that the Internet was producing. He gave the example of the Church of Scientology (vertical hierarchy) vs. Wikipedia (horizontal collaboration). The case of the New York election is even more interesting as the Republican Party (vertical hierarchy) tries unsuccessfully to organize or control conservative activists (horizontal collaboration). It is more interesting because it is political, and shows us the possible re-balancing of power made possible by an internet that allows for quick resource transfer and accumulation (online donations) and organizing through alternative broadcast channels (conservative blogs). And, unlike the Obama campaign, which used these tactics as part of a top-down campaign that included grassroots participation, the national conservative movement is truly beyond the control of the political institution of the American right: the Republican party. It is a sign of power shifts to come, with all the chaos associated with democracy. It is also not clear whether these citizen actions are beneficial, either for the citizens organizing them, the other citizens of New York state, or for America. Is this movement a sign of the potential empowerment of all citizens through similar tactics or an example of a minority empowering itself to the detriment of the majority? A pluralistic nonviolent power environment where citizens can successful challenge political institutions might be advantageous in an authoritarian regime when the government holds an abusive monopoly on power, but in a state like the US, where power is more evenly apportioned, are these movements beneficial to the political whole? In both cases, a disruption of the current political structure occurs, which can have both positive and negative outcomes. I am eager to see the next case study in the story of the networked power shift and see how this trend develops.